Last week I had my first CSUN experience. 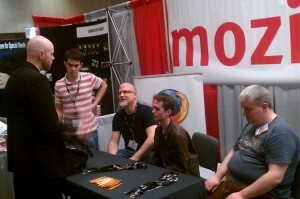 I attended CSUN 2011 at San Diego as part of the mozilla crew running a booth at the exhitors hall (as you may have noticed I have been working in the last months for mozilla a11y). It was a great great experience and very inspiring. We were telling people what mozilla does for accesibility, explaning that our mission is to make a better web open to everyone, including those with disabilities, how we support and help accessibility technologies and projects such NVDA. Also we got a lot of people coming to our booth just to say thanks with a big smile, because they love firefox or because our accessibility support helps them to access the web. As I said, very inspiring. On the social side, it was also a really great experience to meet Marco, a true mozilla star, and hang around with the rest of the AOSB (Accessibility Open Source Band), that is, David (our mozilla accessibility engineering manager), Eitan, Li and Mike (from the GNOME fame) and the awesome nvda guys: Jamie and Mick. This entry was posted in accessibility, gnome, mozilla and tagged accessibility, csun, gnome, mozilla. Bookmark the permalink. Article is very interesting,thanks for your sharing.I will visit this site.And welcome to wedding dresses online shop.